Many disorders of the brain, such as OCD and essential tremor, can be treated by stimulating or disrupting specific locations in the brain. This can be done by placing an electrode directly at the site needing disruption with a procedure known as deep brain stimulation, but it is an invasive procedure that involves drilling a hole in the skull and inserting a wire through the brain tissue. Non-invasive alternatives do exist in which electrodes or magnets are placed on the scalp, avoiding the need for surgery. However, these methods can only be used to treat brain regions quite close to the skull and have limited spatial specificity. Recently, low-intensity focused ultrasound has also been shown to stimulate localized regions of the brain, creating, for example, the sensation of seeing stars in your eyes (known as phosphenes) , when targeted to a region of the brain associated with vision. However, steering and focusing an ultrasound beam to the correct location within the brain remains a challenge due to the presence of the skull. 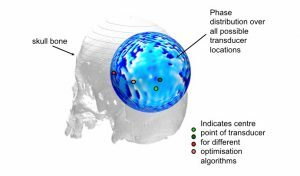 Skull bone, with its varying thickness, curvature, and structure, strongly distorts and attenuates ultrasound waves and can shift the focal point away from the intended target. Consequently, in current human trials, as many of 50 percent of ultrasound stimulation attempts did not elicit a response [1,2]. One solution to more robust focusing is to use ultrasound transducers with hundreds, or even thousands of elements, each of which is individually tuned to account for variations in skull properties so that all waves focus to the intended target location with the brain. However, this equipment is very complex and expensive which, in this early stage of research into ultrasound-induced neuromodulation, has limited progress. Here, we performed a numerical study to assess whether single-element transducers — which are relatively inexpensive — could be used in combination with numerical modelling to achieve sufficient targeting in the brain. 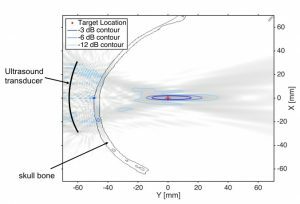 This would provide a solution that can be used as a research tool to further understand the mechanisms behind ultrasound-induced neuromodulation. Figure 1 – Propagation of sound waves from the brain target out to a spherical receiver outside the skull. The received signals are then optimized to determine the best position for an ultrasound source to deliver sound back through the skull. The locations for different optimization methods are depicted by the colored dots. The method works by importing a three-dimensional CT image into a computer and placing a virtual acoustic source at the desired target location. A super-computer then calculates how the sound travels from the target, through brain tissue and the skull bone, onto a sphere outside the head, depicted in Figure 1. From the predicted signals, it is possible to determine the best position of an ultrasound source which can send sound back through the skull to the target location. We employed different strategies for choosing the source location (the dots in Figure 1), and for the optimal strategy predict that a single element transducer can localize sound to a region about 36 millimeters long and 4 millimeters in diameter at depths up to 45 millimeters into brain tissue, which is depicted in Figure 2. Figure 2 – Focusing the sound waves to a region deep within the brain from a curved single-element transducer. The red cross indicates the intended target. 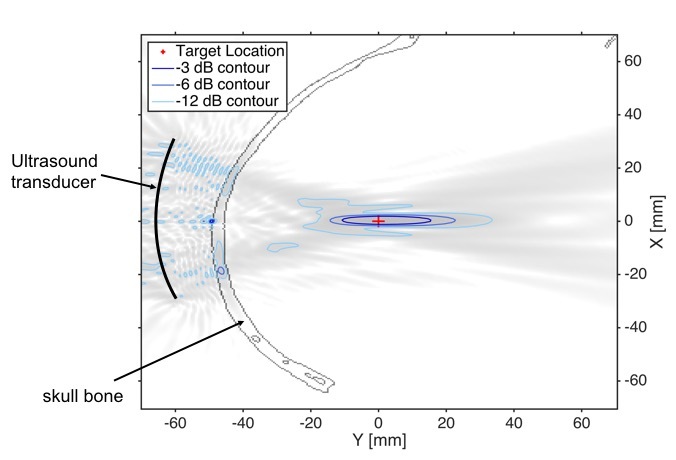 The blue contours represent the acoustic intensity relative to the intensity at the target. -3dB corresponds to 50% of the intensity at the target, -6dB is 25% and -12dB is 12.5%. Lee, Wonhye, et al. “Transcranial focused ultrasound stimulation of human primary visual cortex.” Scientific Reports 6 (2016). Lee, Wonhye, et al. “Image-guided transcranial focused ultrasound stimulates human primary somatosensory cortex.” Scientific Reports 5 (2015): 8743.